It all started some years ago, Maxene told me – she is a member of our Thursday Art Group – when she wanted to get away from water colours, which she did so well – and went to study a new dimension in art. Read about it under the link my review of her last exhibition. 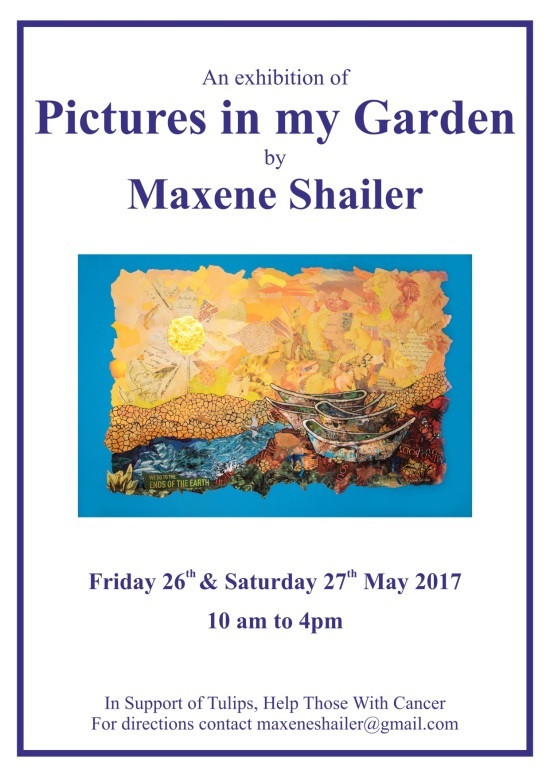 Maxene wants to show her work in her beautiful garden which is the background of her working life, with her studio open for visitors as well. 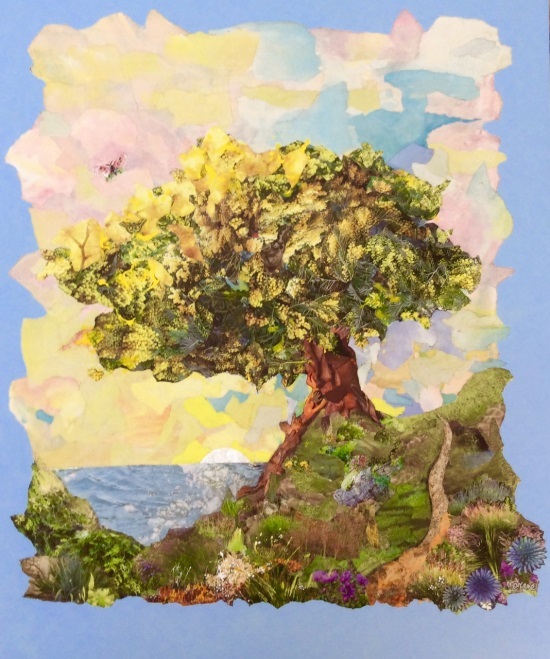 I had told her to show her work in one of the known venues to attract more people but she insisted that it was to be her place where all the beautiful collages have been created. In less than 3 weeks time I hope very much to welcome you to my home to look at pictures in a sunny garden. I've attached the details again in case, like me, you are given to mislaying invitations and missing things. If you don't know where we live please email maxeneshailer@gmail.com and I'll send clear directions to you. I hope through the exhibition to raise some money for Tulips, Help Those With Cancer Association. Delia Heptonstall, a much-loved local resident and a very dear friend died last summer of cancer. Tulips was her rock, offering practical support and endless kindnesses throughout. Tulips members are all volunteers; they receive no funding and survive on our donations. During Delia's last days I painted a picture called 'Fly Free,' which is attached below. It helped me to think of it as the warm and gentle place that she was going to. It will be there for you to see at the exhibition and is open for auction to anyone interested. Offers from £275, which would be the normal selling price. Bids will be sealed and confidential and the result given towards the end of Saturday. There will be prints, cards and book marks of the picture on sale too. Every penny goes to Tulips.